https://sep.yimg.com/ay/yhst-33477391359232/porcupine-puffer-diodon-holocanthus-spiny-puffer-porcupine-fish-long-spine-porcupine-fish-balloon-fish-9.jpgPorcupine Puffer - Diodon holocanthus - Spiny Puffer - Porcupine Fish - Long-Spine Porcupine Fish - Balloon Fish ModerateSemi-aggressive75 Gallon11.8 inchesNoOmnivore, Meaty, Live ShrimpGlobalDiodontidaeSmall 2" - 3"
The Porcupine Puffer is also known as the Porcupinefish, Balloon Porcupinefish, or Porcupine Pufferfish. It is the most well known puffer in the world. 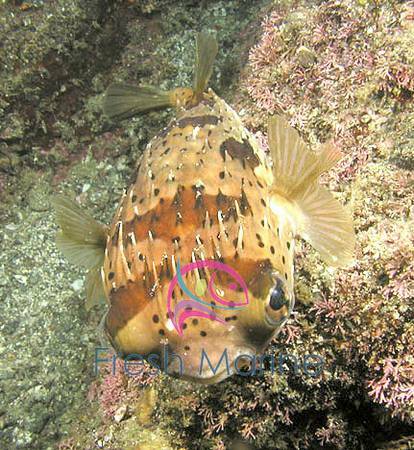 The Porcupine Puffer is olive brown in colour with white under belly. It has brown patches over its back. As its name suggests, the body of porcupine puffer is covered with spines against its flat body. it is very active and likes other fish to swim with it. The Porcupine Puffer has an yellow iris, which makes it quite beautiful. The Porcupine Puffer is well known for its ability to camouflage. Like every other member of the puffer family, the Porcupine Puffer has the capacity to ingest water into the ventral portion of the body makes it distinct. This is mainly done to protect itself from the predators. The Porcupine Puffer is well equipped with strong plated mouth structures which are capable of crushing even the toughest shells. Its teeth resemble a fused beak like structure. This active member of the puffer family is not reef-safe as it would eat many of the invertebrates. The Porcupine Puffer is mostly wild-caught; this variety may contain internal parasites. The Porcupine Puffer uses the pectoral fins for motion as they lack pelvic fins. The Porcupine Puffer is well known for shooting water out of the tank. So, careful attention should be given to the objects surrounding the aquarium as they may get wet. General Size Specifications: This fish will come to you generally between 2-3 inches. Minimum Tank Size: The Porcupine Puffer prefers a tank of 150 gallon or larger with a good protein skimmer. Water Conditions: Keep water quality high (SG 1.020 - 1.025, pH 8.1 - 8.4, Temp. 72 - 78� F). Feeding and Diet: The Porcupine Puffer needs a varied diet of meaty foods including squid, frozen krill, shrimp, mysis shrimp, squid, clams, and cockles to help wear down their ever growing teeth.